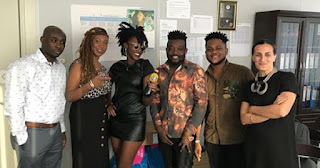 Before the death of popular dancehall diva Ebony Reigns, she had signed a deal with Kasapreko as a brand ambassador for Hi5 Chocomalt. The late dancehall queen broke this news herself when she announced on her Instagram page and from all indications she was really excited about it. Though details of the deal were not made public as it was treated as confidential by both parties but upon what Dawuroo.com has gathered, the deal would have fetched her a sum of $200,000. Sadly, Ebony could not live to enjoy the benefits of this juicy contract. She died in a gory accident with her bodyguard and a close friend with whom she was travelling back to Accra with. She had gone to visit her mom when she met her untimely death after the vehicle in which they were travelling collided with a VIP Passenger Bus.